Great stuff! I've taken a lean six sigma course and learned a lot. I use lean stuff all day long. But you are right, unless you have Jack Welch running the company, it's a lot of wishful thinking to force people to line up in these particular roles. 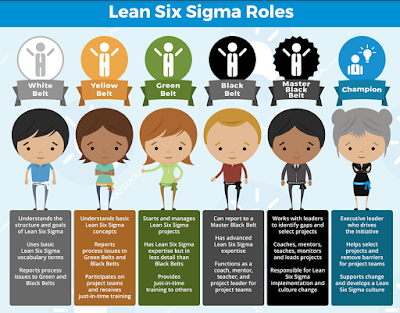 I think good Six Sigma is like good music (most music is crap). There's no mention of purpose, as in why do LSS in the first place. Wouldn't you want at least one of these 6 people to be thinking about the customer, value creation, problem solving? Projects, culture, and all the rest of it is pretty pointless without that.